It should have been a typical Friday night dinner. Along with other families, we were invited to the home of longtime friends in East Talpiot. Only a short fence, a couple trees and a modest yard separate their split level home on the edge of the post-1967 Jerusalem neighborhood from the main street of adjacent Arab village, Jebl Mukaber. In the aftermath of the previous night’s firebombing that killed 18-month-old Ali Bawabshe (and later his father, Sa’ad) in the Palestinian village of Duma, some young residents of Jebl Mukaber did what has become commonplace since the first intifada began in 1987 – they threw rocks over the fence at our friends’ home. That explained the dozen Border Police officers in full combat gear gathered on the sultry evening at the cul-de-sac across from the outside staircase leading down to our hosts’ home. The rocks – around a dozen ranging in size between golf ball and tennis ball – were arranged by our hosts in a neat pile at the bottom of landing by the front door, a tradition they’ve kept to for decades. This time, nobody was outside during the barrage and there was no damage to the house. But they weren’t always so lucky. They’ve had to replace their living room picture window over a dozen times, and they can’t keep track of the firebombs and rocks that have landed inside, outside and around their house. 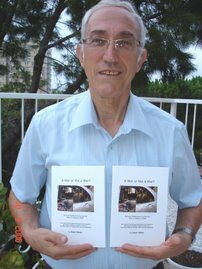 They’ve been featured in the local and foreign media, and former Jerusalem mayor Teddy Kollek was a regular visitor during particularly dark times. Back during the first intifada, our hosts helped organize and participate in meetings between Jews in East Talpiot and Arabs from Jbel Mukaber. 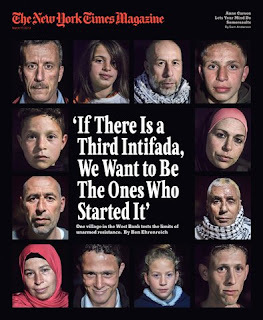 But that project proved short-lived, and by the second intifada over 10 years ago, their home was once again fair game. More than once their Shabbat nap has been shattered by the commotion of security forces traipsing through their yard in chase after rock or firebomb-throwing youth from the village. But life goes on, and – unable or unwilling to relocate – they long ago vowed to live a “normal” existence despite the disruptions and danger. That routine is what brought the dozen guests around the Shabbat table that night. It was only after the main course of baked chicken, sautéed liver and roasted potatoes was winding down that the first harsh cacophony from outside rattled the walls. “That’s only stun grenades, don’t worry,” said our host. “The police are probably just trying to disperse some rock-throwers. Who wants dessert?” With the dinner dishes cleared, and the crumble cake and tea on the table, the tranquil Friday night spirit returned. That was until a sharp burst of light flashed by a side window off the living room. A few seconds later, a tree and brush in the yard next door were ablaze where a firebomb had exploded. “We’d better take care of that,” said our host, jumping out and rushing outside to unravel the garden hose. With the help of some of the younger guests, the fire was doused, and with smoke seeping into the house, we gathered around the table again. “This is how you live, with this craziness around you all the time? How do you do it?” asked one of the guests.“You get used to it, and luckily, nobody has ever been hurt,” said our hostess. This wasn’t aimed at a remote West Bank outpost or settlement, it was in the sovereign capital of Israel. “Don’t linger on the steps when you go up. Nobody’s been hurt yet, we don’t want that streak to end,” said our hostess cheerfully. At the top of the landing, the border police were back at their perch following the earlier activity. Their helmets off, they were munching on some food that neighbors had brought out. The warm evening had turned very quiet, as if the action of a few minutes earlier had been on a wide-screen TV as part of a suspense film instead of the reality of a Friday night in Jerusalem. Like our hosts, the security forces were attempting to enjoy the brief wash of tranquility. They knew that the night was still young – and those inviting picture windows were an enticing target. If you go to the Arabic Wikipedia entry for Nabi Saleh today, you will see only a small fraction of what we saw then. Every single reference to the village people's adoration of jihad, martyrdom and death to the Israelis has been erased. The place is filled with virgins all over again. · We have now saved the original Arabic text here. · For those without an online translation capability to do Arabic-to-English, here is the same page rendered into English courtesy of Google Translate. Why Isn't Gaza Being Rebuilt? It’s been a year since the last summer’s war in Gaza ended and those who lost their homes during the fighting are still waiting for them to be rebuilt? To listen to Palestinian propagandists, this is the fault of Israel. That’s the conceit of an op-ed published Monday in the New York Times by author Mohammed Omer. According to Omer, Gaza is a “Gulag on the Mediterranean” still suffering under Israel “occupation” even though the Jewish state withdrew every last soldier, settler and settlement ten years ago. All the strip’s problems can, he writes, be attributed to an Israeli siege that imprisons and stifles the Palestinians living there. But, oddly enough, a slightly more realistic evaluation of their problems was to be found in a news article published by the Times the day before. The reason why not a single one of the 18,000 homes destroyed or damaged in the war has not been made habitable isn’t because the Israelis are preventing it from happening. Even Hamas government officials concede that the Israelis haven’t stopped the shipment of cement and other building materials designated for civilian reconstruction from entering Gaza. Some of the problem lies in a cumbersome process needed to approve such shipments. The failure of international donors, especially from the Arab world, to make good on their pledges to help Gaza is also huge. But the main problem is that although homes aren’t being rebuilt, there is a lot of construction going on in Gaza. Unfortunately, the work is concentrated on the building of terror tunnels and other military infrastructure that will enable Hamas to launch another war on Israel if it suits their political needs or the whims of their Iranian allies. Omer’s argument is a familiar one. Israel ought not to be allowed to prevent free entry in and out of Gaza for people or goods. The siege — in which Egypt plays as much a role as Israel though Omer barely mentions that point — reduces the Hamas government to a “municipal authority.” But this is nonsense. The reason why the international community has no problem with the loose blockade of Gaza is that it is run by a terrorist organization. Gaza is an independent Palestinian state in all but name, and its government believes its main purpose is to wage a war on Israel to end the “occupation.” But by occupation, it doesn’t refer to an effort to get the Israelis to withdraw from the West Bank or even Jerusalem. Rather, as Hamas tells us over and over again in the public statements made by their leaders and its charter, occupation refers to all of Israel. Their war is not a limited one but an existential conflict whose only goal is to end Israel’s existence. It maintains its tyrannical control over the strip by trying to focus public anger at the Israelis and their Fatah rivals in the West Bank. The reconstruction problem is terrible for the people of Gaza, but it also points out how the propaganda about Israel creating a humanitarian crisis there is a myth. Every day truck convoys of food, medicine and construction material approved by the joint commission run by United Nations, the PA and the Israelis arrives. But somehow that has not resulted in the rebuilding of homes since, as the Times reports, homeowners who are able to purchase the needed material resell it on the black market. That ensures it winds up being used, alone with Iranian aid smuggled into Gaza, to build more tunnels along the border with Israel or other military projects. Everyone knows that the joint monitoring system has failed to stop the use of international aid for Hamas terror projects. Meanwhile, as the Times notes, 37,000 tons of cement allowed in by Israel sits unused in warehouses. This is largely due to Hamas incompetence and the fact that the Arab world is dubious of sending money to Gaza that won’t be used to help people. This is a tragedy, but sympathy for suffering Palestinians and criticism of Israel won’t make anything better for them. Had the Palestinians used the Israeli withdrawal to build a free society and their economy, it might have thrived. Instead, the bloody Hamas coup enabled the terror group to transform the strip. But instead of a prison, it is a terror fortress. If demands by so-called human rights groups for granting Gaza an open border were agreed to, it would result in the strip becoming even more of a military menace both to Israel and Egypt, not freedom for its people. The problems of Gaza will only be solved when it is run by leaders that value the lives and the property of their people as much as the Israelis do. With Iran looking to invest some of the vast wealth that will come to it under the nuclear deal in aiding Hamas, there is little doubt there will be more bunkers and tunnels built in Gaza but few homes. It’s time for the international community to focus on the real problem. When they are no longer under the thumb of a group that is obsessed with an ideology of hate that prompts them to fight for Israel’s destruction, the Palestinians will rebuild Gaza and there will be no more danger of another war. Hamas announced on today that underwater "frogmen" commandos operating just off the coast of the Gaza Strip managed to stop a dolphin that it claims was spying for Israel. Officials in the Palestinian Islamist organization say that the dolphin was equipped with a surveillance device. "They could tell he was on a mission because of his porpoiseful behavior." 1. Hunger strikes, particularly those undertaken for political reasons, pose a challenge to any democracy. On the one hand, governments have the responsibility to protect the life and health of those in their custody. On the other hand, they are reluctant to undermine an individual’s decision to refuse food as a method of protest. 2. Israel has faced this dilemma for several years now. Periodically, inmates in Israeli custody - particularly administrative detainees held on terrorism charges - choose to undergo hunger strikes, occasionally for extended periods. Their goal is not to end their lives, but rather to exploit their condition and the subsequent publicity they receive to generate pressure on Israeli authorities to release them, thereby facilitating their return to terrorist activities. 3. The matter has again come to the public’s awareness following the extended hunger strike of Muhammad Allan, a detainee from the Islamic Jihad terrorist organization. Allan, previously convicted of recruiting a suicide terrorist, is currently held in administrative detention for planning large-scale terrorist attacks with fellow Islamic Jihad terrorists. 4. The issue has gained particular attention due to a recent amendment to Israel’s Prison Ordinance ("Preventing Damage from Hunger Strikes”), which aims to resolve the matter in a manner that balances a person’s desire for autonomy over his/her body with the government’s duty to safeguard the health of persons in its custody. The amendment establishes a mechanism that allows for the administration of non-consensual life-saving medical treatment in certain and highly limited circumstances, under strict legal and medical control. The mechanism includes a decision by a senior judge (a District Court President or Deputy President), on the basis of the independent medical opinions of the detainee's treating physician and a medical ethics board, and following a hearing with the detainee's attorney. The law clearly states that the administered treatment must be the minimal treatment necessary to preserve the life of the hunger striker or to prevent severe irreversible disability, while maintaining the utmost respect for his personal dignity and preventing unnecessary suffering. Additionally, it should be noted that all hunger strikers receive regular visits by the International Red Cross, as well as by personal attorneys and private physicians, when requested by the detainees in accordance with the law. 5. The amendment accords with international law norms. There are many views regarding this issue in the international arena. In fact, the administration of artificial nutrition to prisoners, against their wishes, is permissible in a number of Western countries. In this context, it is important to note several rulings of the European Court of Human Rights (ECHR), especially a 2005 decision (Nevmerzhitsky v. Ukraine, Para. 94) which permits even force-feeding prisoners in certain circumstances. A similar ruling was given by the International Criminal Tribunal for the former Yugoslavia in the 2006 Vojislav Seselj case. Both of these tribunals, in line with the new amendment, recognize the obligation of the state to safeguard the health and life of hunger strikers while balancing this commitment with the prisoners' rights. 6. While the amendment‘s goal is to save lives, attempts are currently being made to misrepresent it. Opponents to the law are attempting to portray it as being equivalent to forced feeding through a feeding tube administered without painkilling measures. This is not the case. The life-saving treatments available under the law include regular medical procedures such as the intravenous administration of total parenteral nutrition (TPN), widely used for patients - including children - who cannot consume a diet in the regular manner. Previously-existing legislation also gives physicians the right to consider other necessary medical procedures, such as performing blood and urine tests and dispensing medications and salts. Any treatment or test must be done in a manner consistent with a doctor’s ethical obligations, including the proper use of pain management methods. The law does not instruct doctors what to do – any treatment is subject to the medical and ethical judgement of the treating physician. What it does do is give the medical community the authority to save the lives of hunger strikers. A similar authority traditionally exists in the case of individuals who want to commit suicide or who suffer from diseases such as anorexia, and who reach a life-threatening condition. According to Abu al-Walid, a Palestinian researcher, many Palestinians captured by Shiite militias in Iraq have been brutally tortured and forced to "confess" to their alleged involvement in terrorism. Since 2003, the number of Palestinians there has dropped from 25,000 to 6,000. Most interesting is the complete indifference displayed by international human rights organizations, the media and the Palestinian Authority (PA) toward the mistreatment of Palestinians in Arab countries. International journalists do not care about the Palestinians in the Arab world because this is not a story that can be blamed on Israel. PA leaders say they want to press "war crimes" charges against Israel with the International Criminal Court. However, when it comes to ethnic cleansing and torture of Palestinians in Arab countries such as Iraq, Syria and Lebanon, they choose to look the other way. An Arab killing or torturing an Arab is not an item worth publishing in a major newspaper in the West. But when a Palestinian complains against the Israeli authorities or Jewish settlers, many Western journalists rush to cover this "major" development. This post is about making a radical change to the education that Palestinian Arab children get in their schools. A change for the better, but then - as most people know - that's not saying much. We have posted here about UNRWA dozens of times over the years. Why? Because its existence is a fundamental pre-requisite for the hatred and passion for lethal violence that is cynically injected daily, year after year for almost 66 years into the blood and consciousness of generations of Palestinian Arab children. This has been happening for nearly seventy years. 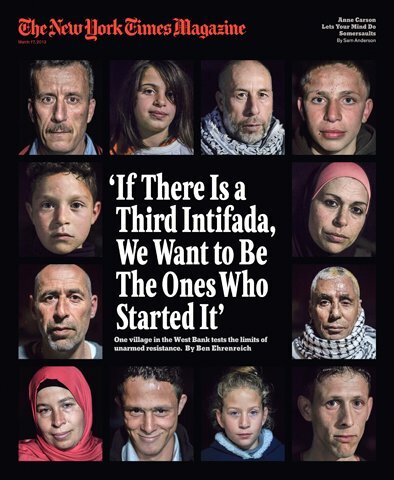 As refugee support organizations, can there be one as spectacularly ineffective as UNRWA? As a terrorist training institution, can there be one as heart-breakingly effective as UNRWA? We have recently been focusing on the money problems at the billion-dollar-annual-budget agency, and how its absolutely sickening focus on educating for terror goes unremarked, unchecked and un-stopped by all of the world's agencies for the protection of children. We're referring, in no particular order, to UNICEF, Defence for Children International, UNESCO, Child Rights International Network, UN Committee on the Rights of the Child, the Washington-based Jerusalem Fund, Save the Children, Arab Council for Childhood Development and numerous others. Thousands of bureaucrats, hundreds of fund-raisers and no one with enough time to address the daily disaster which is Palestinian Arab education. · 19-May-14: Will momentary focus on UNRWA throw any light on PA and Hamas abuse of their own people? And if that's not enough, there's a distinct loss of perspective here. The Palestinian Arabs are part of a larger Arab world that includes several of the world's wealthiest populations both per capita and in absolute terms. If they can't fix this, they don't want to fix it. The funds of which UNRWA is so desperately short amount to 0.05% (in simple words: one twentieth of one percent) of the sum reported to be being laid out by the Qataris alone for something else of a comparably urgent life-and-death nature. Why single out Qatar? Because of the gas-soaked family business' fraternal passion, endlessly trumpeted, to "leverage the enormous and abiding symbolism of the Palestinian cause to both enhance its own profile and credentials" [source]. Since Qatar's owners read the news and know about the existential dangers of which UNRWA bleats, and do nothing to help, might it be a smart move if Israel were to step up and offer to take over the education budget of the morally-and-otherwise bankrupt UNRWA? And develop a suitable educational curriculum that actually promotes peace? What an opportunity. And cheap at the price. And if children's minds and welfare mean something to you, as they do to us, prepare to weep. I cannot count the number of times that I heard from Israeli Jews the phrases "I'm ashamed" and "I'm sorry" in response to the horrific crime that claimed the life of Palestinian toddler Ali Dawabsha in the West Bank village of Duma last week. The Israeli leaders' condemnation of the baby's murder is a sincere voice that reflects the views of the overwhelming majority of the Israeli public. In contrast, the Palestinian leaders' denunciations of terror attacks do not reflect the general feeling on the Palestinian street. Each time Abbas reluctantly condemns a Palestinian terror attack, he faces a wave of criticism from many Palestinians. Unlike the Israeli public, many Palestinians often rush to justify, and even welcome, terror attacks against Jews. 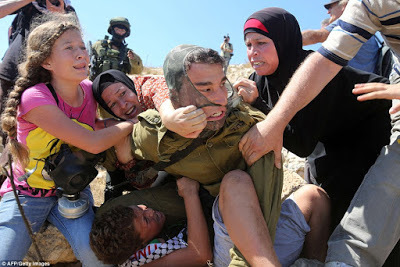 This was the situation just a few weeks ago, when an Israeli man was shot dead near Ramallah. Several Palestinian factions and military groups applauded the murder, calling it a "natural response to Israeli crimes." This is the huge difference between the way Israelis and Palestinians react to terrorism. The murder of Dawabsha saw thousands of Israelis hold anti-violence rallies to condemn the horrible crime. But has anyone ever heard of a similar rally on the Palestinian side whenever terrorists kill innocent Jewish civilians? Is there one top Palestinian official or prominent figure who dares to speak out in public against the murder of Jews, at a rally in the center of Ramallah or Gaza City? Has there ever been a Palestinian activist who dared to hold a rally in a Palestinian city to condemn suicide bombings or the murder of an entire Jewish family? While Israelis have been holding rallies to condemn terror attacks against our people, we have been celebrating the killing of Jews. How many times have we taken to the streets to hand out sweets and candies in jubilation over the killing of Jews? Such sickening scenes of men and women celebrating terror attacks against Jews on the streets of the West Bank and Gaza Strip have never been condemned by our leaders. These scenes have become commonplace each time Palestinian terrorists carry out an attack against Jews. These scenes stand in sharp contrast to the public statements and rallies in Israel in response to terror attacks against Palestinians. Our leaders need to learn from Israel's President, Reuven Rivlin, who said he was "ashamed" and "in pain" for the murder of the Palestinian toddler. When was the last time a Palestinian leader used such rhetoric to condemn the murder of Jews? The laconic statements issued by Abbas's office in response to anti-Jewish terror attacks never talked about shame or pain. We have failed to educate our people on the principles of tolerance and peace. Instead, we continue to condone and applaud terrorism, especially when it is directed against Jews. We want the whole world to condemn terrorism only when it claims the lives of Palestinians. We have reached a point where many of us are either afraid to speak out against terrorism or simply accept it when it claims the lives of Jews.The Israeli president has good reason to be ashamed for the murder of the baby. But when will we Palestinians ever have a sense of shame over the way we are reacting to the murder of Jews? When will we stop glorifying terrorists, and naming streets and public squares after them, instead of strongly denouncing them and expelling them from our society? We still have a lot to learn from Israeli leaders and the Israeli public.